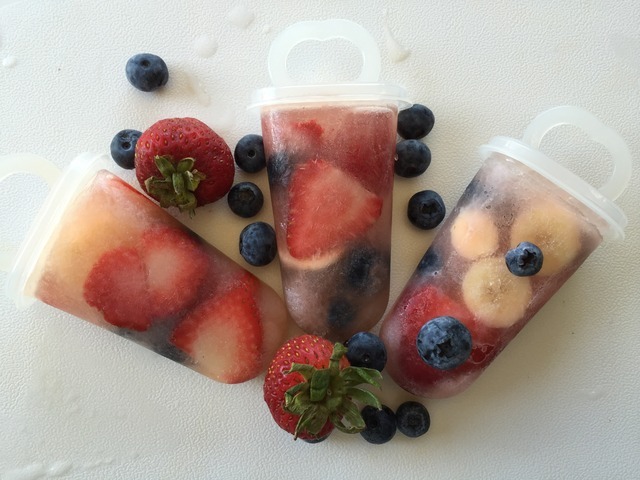 Banana Berry ice pops for a healthy frozen treat. Summer is in full swing, which means my cart runneth over with all sorts of yummy frozen treats from the grocery store. I made a batch of these Banana and Berry popsicles last night after we discovered that our freezer was sadly lacking. When I was growing up we always had homemade popsicles in the freezer but it had been awhile since I made a batch for my own kids. 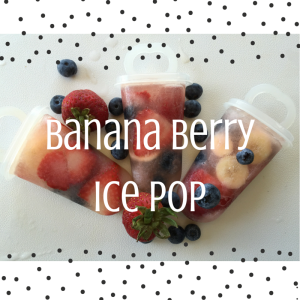 It’s easy to make a batch of beautiful, delicious and healthy Banana Berry Ice Pops. There’s nothing better than a freezer stocked full of homemade frozen treats when a heat wave hits! 1. 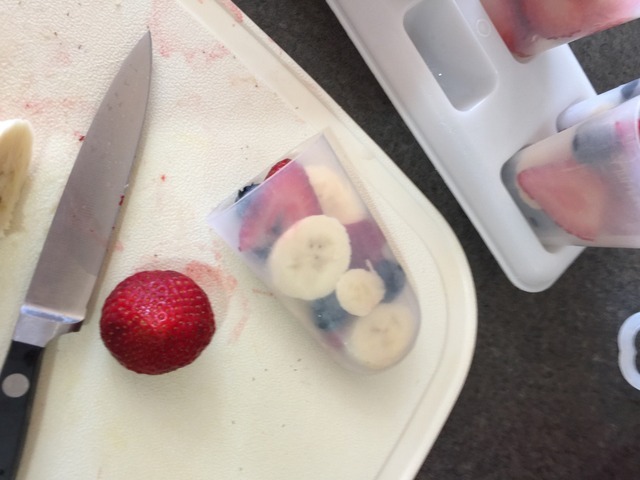 Line popsicle moulds with the sliced fruit. Place the berries in the centre of the moulds to hold everything in place nicely. 2. Fill the popsicle moulds with pure white grape juice. Pour gently and slowly to keep the fruit in place. 3. Pop the tops onto the moulds and put them in the freezer overnight. 4. When you need a cool treat, run the moulds under some warm water and gently pull the popsicles out. These pops look delicious. They will make a perfect after school treat. The weather is very hot for Wisconsin…we are not used to 90 degrees days in September. These look like a fun treat to keep you cool during these hot summer days! I think my four year old would probably love snacking on one of these! We’ll have to give them a try. These are beautiful! I absolutely love fruit and these sound so wonderful to me. Yum! Those look fantastic!! My kids would love them too! What a nice healthy snack! I so need to make this for my kids instead of sugary popsicles! These look so healthy and delicious. I need to get some fun popsicle molds. Wow, what a yummy recipe, your pics are beautiful for asking these and so easy to follow! I am going to try this with my kids this weekend. These look positively mouthwatering! Such a healthy yet refreshing treat! These look so delicious and perfect for the end of summer! I’ll have to make some for the kids to enjoy this weekend! Yummy. This is a great way to enjoy fresh fruit on a hot day. It looks so yummy! I can’t wait to try it! Now these sound delicious. Using white grape juice was a great idea. How delicious! I love the concept of using white grape juice. I think I’m going to have to try this. Mmmmm, I bet those taste so fresh and delicious! A perfect summer snack! These are right up my alley. All of my favorite fruits in a yummy dessert! These are so great! Love how you left the fruit whole instead of blending it all up first. Well those just look tasty delicious. I’d love to make hose for my kiddos and my granddaughter. So white grape juice is the secret right?? Awesome! They look beautiful! That is a fantastic variation on the sugary ice pops in the box – I must try these. Good combo, too. This would be a Frozen Fruit treat that I would totally love. It looks so fresh. My kids would love it too! What a nice refreshing treat for these hot long summer days! I like that it is a healthy option! Great! I’m always looking at new ways to make pops. I can’t believe I didn’t think about this one! Thanks! Oh they look delicious! 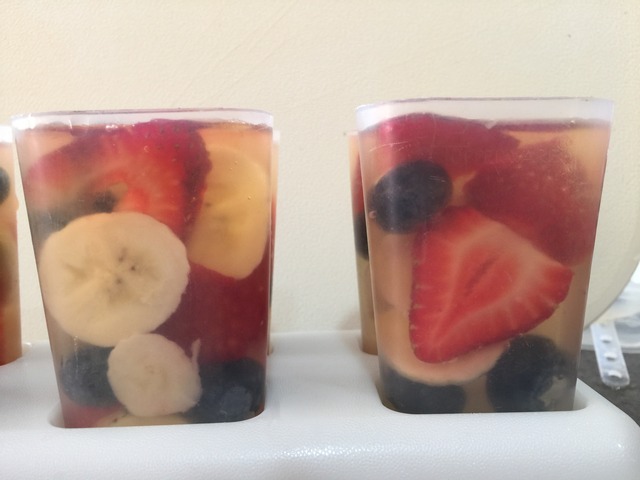 I am loving these I love that there is full sized fruit in it too my kiddos would love these! My kids would love it, too, because they LOVE fruit. I’m headed to the kitchen to make these! 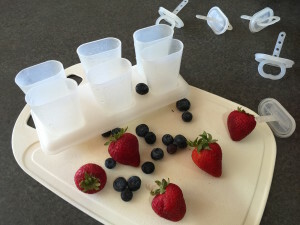 What a great (and easy) idea to help the kids cool off and enjoy a treat! I’ve got all these ingredients and will surprise the kiddos when they get home from summer school today! these would be great to make in fact think I will be making some on my day off with the grands. They will love them and they are approved on my diet as well YEAH!!! How cool. Plus refreshing and yummy. I want to try this for sure. Those are so gorgeous and fresh looking. 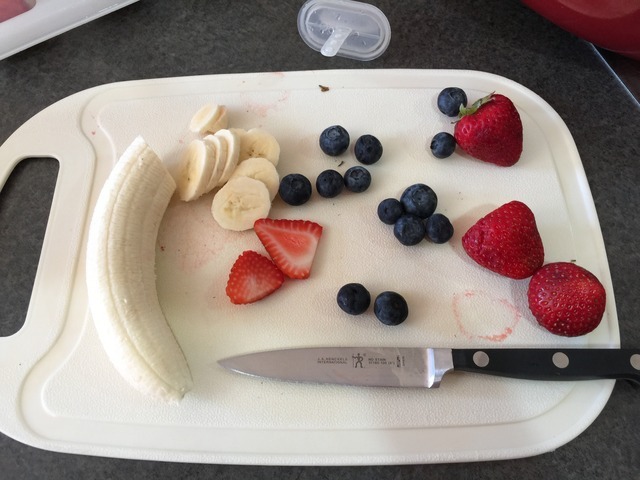 And my kids’ three favorite fruits!